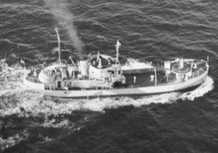 Type and Characteristics - WYP-171; built by Snow Shipyards, Inc., Rockland, ME, as a commercial wooden-hulled fishing trawler, named St. George, 1940; commissioned by the Coast Guard 7 July 1942 at a cost of $75,000 to convert hull, renamed Nogak; 300 tons displacement full load, 111ft long x 23ft6in beam x 11ft8in draft; main engines- 1 Fairbanks Morse, 5-cylinder diesel; propellers- single; BHP- 500; armament 1-6-pdr. ; 2-20mm/80; 2 short track depth charge racks; crew approx. 18 to 20. Log Period and Areas of Service - 1942-44, Greenland patrol. 31 July 1942 - Commissioned and assigned to CINCLANT stationed at Boston, MA. Operated on the Greenland Patrol. Fate - Decommissioned 24 July 1944, and returned to War Shipping Administration. 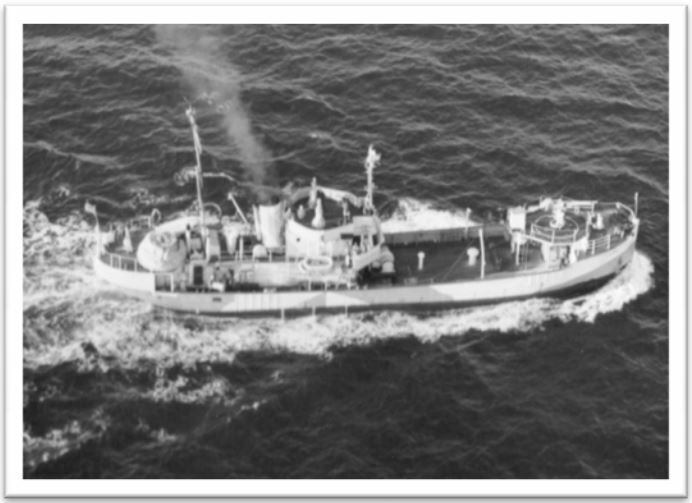 Note: Author Sloan Wilson joined the Coast Guard in 1942, first reporting aboard the USCGC�Tampa�on the Greenland Patrol.�He was then given command of the trawler USCGC Nogak.�His novel�Ice Brothers�is based on his experiences with the�Nogak.